Eyeglasses can be a necessity (if you’re visually challenged) or a fashion statement (if you’re accessory obsessed). Either way they should fit your face and your personal style. L.A.’s trove of eyewear boutiques offers everything from rare antique and vintage specs to cutting-edge designs and hard-to-find frames from around the globe. Looking for a turn-of-the-century monocle or a pair of 1960s prison glasses? Gentleman’s Breakfast is a manly place, in a Teddy Roosevelt sort of way. Expect to find dudes in ascots sitting in wing chairs, sipping scotch and puffing on pipes, inside the tiny shop. These are guys who appreciate selvage jeans and heritage brands, so their eyewear tends toward classic American companies like Persol and American Optical. The store also sells various sundries for the dandy, such as vintage cuff links, watches, and bow ties. Prescriptions can be filled on-site, and old frames can be Beau Brummell-ized. » 1101 Mohawk St., Echo Park, 323-306-6766. With its stark white walls and bright lighting, Eyetailor sends off a gallery vibe. The tightly curated frames from around the world are displayed like works of art. Standouts include sculptural offerings by France’s Eye’DC, sheet metal styles by Berlin’s Mykita, and handcrafted (since 1905) pieces by Japan’s Masunaga. The in-house optical lab fills prescriptions and does custom work like nose pads and rimless lenses. » 4310 Melrose Ave., East Hollywood, 323-664-2020. Each Hotel De Ville Vintage Eyewear location evokes a swank hotel lobby. The Beverly Boulevard branch has velvet divans for lounging; a baby grand piano is parked in the Los Feliz spot; the Westside venue skews midcentury modern. All three carry a vast selection of frames that span the decades, including lines by Gucci, Cartier, and Christian Dior from the ’60s and ’70s—perfect if you’re goal is to go glam. » 7422 Beverly Blvd., Beverly Grove, 323-634-9911; 4646 Hollywood Blvd., Los Feliz, 323-664-1462; 11307 Mississippi Ave., West L.A., 310-312-8899. A Los Angeles institution for more than 25 years, l.a. Eyeworks has one outpost on Melrose Avenue (“the mothership”) and another on Beverly Boulevard (“the flagship”). 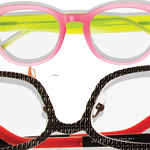 The latter, designed by architect Neil Denari, looks Kubrick-esque and is packed with the brand’s own candy-colored eyewear designed by founders Gai Ghe-rardi and Barbara McReynolds. Their creative frames are rooted in strong shapes and have a pop art sensibility à la the neon blocking of Andy Warhol or the graphic printing of Roy Lich-tenstein. They’re not for shrinking violets. » 7407 Melrose Ave., Beverly Grove, 323-653-8255; 7386 Beverly Blvd., Beverly Grove, 323-931-7795. The shoe box-size Old Focals is filled floor to ceiling with dead stock frames, mostly ’50s and ’60s plastic Buddy Holly numbers and cat’s-eye models studded with rhinestones. You can also find the occasional ’70s label like Luxotica as well as newer ones from the ’80s and ’90s. The shop’s biggest claim to fame is its connection to the entertainment industry; it has outfitted the players in Django Unchained, Gangster Squad, and Tinker, Tailor, Soldier, Spy. Styles worn on Mad Men are for sale—you just have to decide whether you’re more Harry Crane or Roger Sterling. » 45 W. Green St., Pasadena, 626-793-7073. You might be surprised to find quaintness behind the barred windows of Society of the Spectacle. Inside a bungalow wooden curios and cabinets display quirky handmade ceramics and dog collars made by Masai tribesmen, and you can snack on Auntie Em cupcakes while perusing such hip contemporary brands as Oliver Peoples, Paul Smith, Francis Klein, Garrett Leight, Dita, Salt, and Ray-Ban. » 4563 York Blvd., Highland Park, 323-255-4300.